At some point in college, when I was flying in and out of Philly frequently, I spotted an exhibit at the airport by Lindsay Feuer. Usually I walk by airport exhibits with glance or two, or if I have time, meander around them. Feuer's work stopped me in my tracks and got my nose against the glass for about twenty minutes. Her work is incredibly detailed and precise. She describes herself as creating hybrids of biological ambiguity, sculptures that look born rather than made. To see a display of her art is like looking on an alien terrain. I think she uses some casts to achieve some of the detail, but there is an amazing art to putting the pieces together in keeping with the detail of the casts and in a way that makes the sculpture look alive. 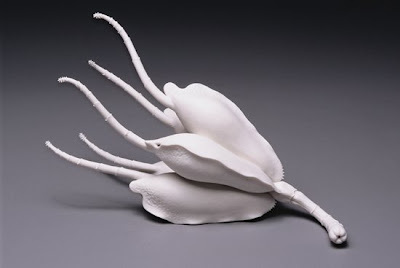 Feuer works in porcelain (my favorite), so she can achieve amazing precision with skin-like translucency. The surfaces are unglazed and can be smooth or finely textured.